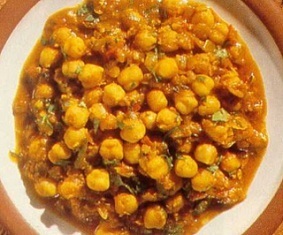 This dish features chickpeas, with their faintly nut-like flavour and smooth texture. Chickpeas are rich in protein-nitrogen compounds. Cooked in this spicy sauce they’re great served with Puffed Fried Breads (Pooris), with capatis, or with hot Boiled Rice. Wash and drain the chickpeas; then soak well-covered in water overnight. Drain. Place the chickpeas, water, and bay leaf in a heavy 3-litre/quart saucepan and bring to the boil over high heat. Reduce the heat to moderate and simmer the chickpeas for 1 hour or until they are butter-soft but not broken. Remove from the heat. Drain, reserving the liquid. Remove the bay leaf. Place 1/3 cup cooked and drained chickpeas in a blender or food processor with a little cooking liquid. Process to a smooth puree. Remove the chickpea puree and place it in a bowl. Set aside. In a coffee grinder or blender or with a mortar and pestle, combine and crush to a powder the cardamom seeds, whole cloves, black peppercorns, cinnamon stick, and cumin seeds . Heat the ghee or oil in a heavy 2-litre/quart saucepan over moderately high heat. When hot, stir in the fresh ginger and green chili and saute for 1 minute. Remove the pan from the heat and add the cayenne, asafoetida, turmeric, paprika, and ground coriander. Add the ground spice powder, chickpeas, lemon juice, salt, the pureed chickpeas, and enough reserved chickpea cooking-water to make a gravy. Simmer for 6 to 8 minutes; then remove, garnish with minced fresh coriander, and serve hot.